When you need rodent control for your home in Fullerton, California, it is important to find a reliable company to perform exclusion services sooner rather than later. 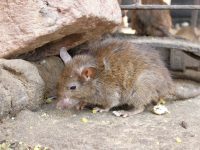 Rats can quickly cause unsanitary conditions throughout a home by urinating and nesting in spaces such as insulation. They also have a propensity for chewing and can damage wiring and other important installations. Once our system is installed in your home, we will return at regular intervals to monitor progress and rebait traps until there are no more signs of an infestation. Upon completion of our service, we’ll provide you with a two-year warranty, so you’ll be able to rest easy knowing the infestation won’t recur. In addition to rodent control, Kilter can also help restore sanitary conditions in your home. For example, we can remove any insulation where rodents nested and replace it with TAP Pest Control Insulation, which will provide an additional barrier against a wide range of common household pests. For more information about the rodent control services that we provide to the residents of Fullerton, CA, contact Kilter Termite and Pest Control today.